Lamprophyre. (Gk. lampros = bright; porphura = purple). Mica lamprophyre texture, Petit Portlet, Gorey. In Jersey, they occur as dykes of two main types, the more abundant biotite lamprophyres with orthoclase, making them minettes, and the rarer hornblende lamprophyres with plagioclase making them spessartites (but nothing to do with the garnet spessartite/tine). They are the easiest group to identify and classify. They intrude all the main rock formations with one group striking N-S and another group striking in various directions around NW-SE. Bishop & Bisson (1989, p. 66 et seq.) describe them in detail relating them to different country rock formations and identifying phenocrysts of brown, colour-zoned biotite plus augite, and olivine altered to serpentine in a groundmass of orthoclase feldspar. 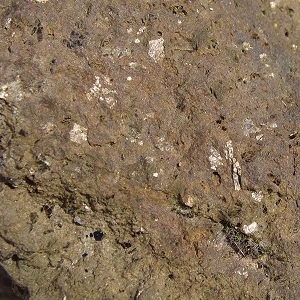 The biotite lamprophyres occur as c. 1m - wide medium to dark brown, coarsely crystalline dykes with large brown highly reflective biotites in a friable groundmass. They are therefore softer than the rocks into which they are intruded and are thus weathered and eroded to produce gullies, for example, in the granite on the south side of Le Petit Portelet bay below Gorey Castle and in the Jersey Shale Formation south of St. Aubin harbour towards Belcroute Bay (Nichols & Hill, 2004, p. 17 & p. 28). They are also excellently exposed, slightly weathered and eroded to produce shallow gullies, in the granite cliffs at the back of La Grève au Lanchon (Plémont Bay) in the Northwest Igneous Complex. Their strike, sometimes curved, is generally c. NW - SE cutting across pink aplite veins and dykes. 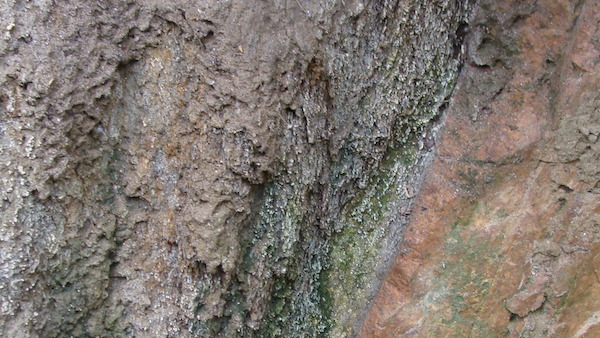 Mica lamprophyre dyke, in shale. St. Aubin to Belcroute Bay. Mica lamprophyre dyke, South Hill. At South Hill, St. Helier, the hornblende mica lamprophyres are lighter coloured (spessartites) and further east at Le Croc Point, near La Motte (Green Island), a composite hornblende lamprophyre crops out. It has basic margins changing inwards to acid (microgranite) zones and a camptonitic (strictly augite-plagioclase) centre zone (Bishop & Bisson, 1989, p.66) but contains phenocrysts of brown amphibole. Lees (1990, p.277) describes this as an appinite because of the abundance of long, brown hornblende crystals. 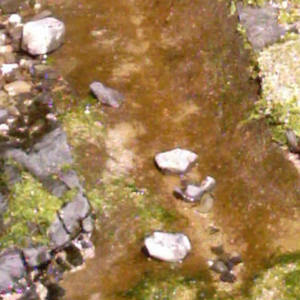 His study of these intermediate rocks and the appinites included the same parameters as those for the basic dolerites and is summarised in the Dykes page of the website. For example, the variation in SiO2 content is presented and clearly shows the basic-intermediate nature of these rocks amid the basic and acid groups which the author equates with the extrusive equivalents (loc. cit. p. 278). From analysis of the rare earth elements of the South Hill hornblende - mica lamprophyre it seems that it could have stemmed from low pressure (high crustal level) fractionation but because it is so mixed, this origin is thought too simple. In terms of origin, Lees (loc. cit. p. 287) states that the paucity of rocks of genuine intermediate composition in the dyke sequence is a problem for a derivation from a one parent magma. Analysis of the rare earth element profiles of these and the acid dyke rocks seems to show that they are not linked to high crust level fractionation of basalt and it is concluded that amphibole fractionation would be a more likely process - possibly producing the abundant hornblendes in the appinites. Bishop, A. C. and Bisson, G. 1989. Classical areas of British geology: Jersey: description of 1:25,000 Channel Islands Sheet 2. (London: HMSO for Brit. Geol. Survey). Lees, G. J. 1990. The geochemical character of late Cadomian extensional magmatism in Jersey, Channel Islands, p. 273 - 291 in The Cadomian Orogeny, Geol. Soc. Spec. Publ. No. 51. (see D'Lemos et al. above).